Bank Lead. Old school bottom fishing lead. Best used with 3-way swivel or on standard chicken rig. High Quality Egg Leads with extra small hole. 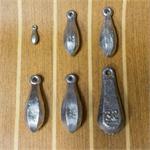 Excellent for rigging bait and bottom fishing. Price per 10 lbs. bag. LMR Wahoo Trolling Lead - Copper tube liner prevents cable from opening hole. This lead makes rigging & re-riggin a snap! Stick Lead Great for deep water fishing. Has brass ring eye.